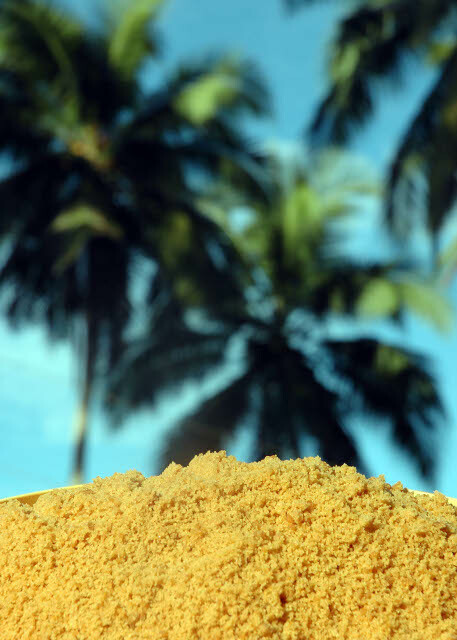 Coco sugar is derived from coconut sap or toddy, locally known as “tuba”. When freshly gathered, coconut tree sap is oyster white in color and is inherently sweet. The sap contains 12–18% sugar in its natural form with important vitamins and amino acids. Coco sugar is also rich in nutrients and high in potassium, phosphorus, magnesium, sulfur, calcium, and vitamin C.
With its health benefits, the Philippine coconut sap sugar is gaining popularity here and abroad. Consider its glycemic index (GI) at 35. This is much lower than the 54 GI, the level which nutritionists consider as safe for people who have to watch out their glucose level. A natural sweetener and functional food, coco sugar is a much welcome development for diabetics and hypoglycemics. The inflorescence of the coconut tree provides the sap that is made into sugar. Each tree in good stand can yield an average of 2 liters of sap daily. At least four coconut trees are needed to produce one kilo of sugar per day. The production and the sugar content of the sap, however, are also determined by the location and the tree variety, as well as other factors such as the season, nutrition provided for the tree, the time and the way tapping is done. A simple farm-level technology, the production of coco sugar is a natural process of heat evaporation to convert liquid sap to solid form of sugar granules. It requires no complicated and high-cost machineries or equipment nor a huge capital. Source: Ricardo R. Argana, S&T Media Services- PCARRD Farmnews, DOST, January–March 2011.